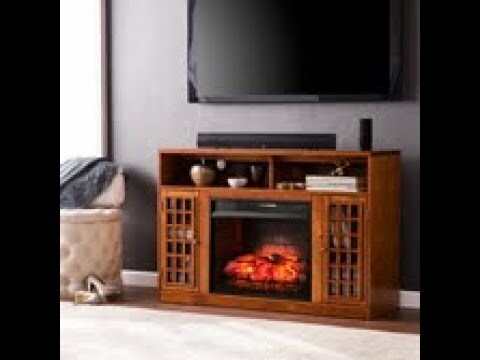 Contemporary styling and modern functionality come together in harmony with the Narita Electric Fireplace Media Console by Southern Enterprises. The media console features a rich glazed pine finish and lattice style cabinets with adjustable shelves. 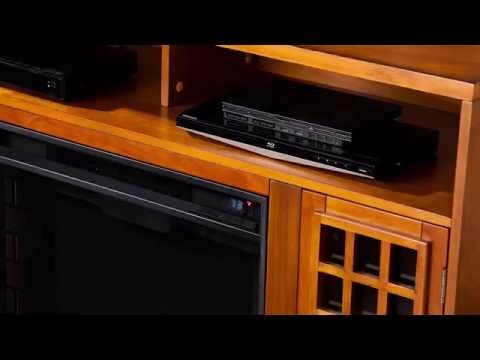 Extra storage is provided with the top shelf to accommodate all of your media accessories. The energy efficient LED firebox features realistic, multicolor flames and a glowing ember bed that are complemented by a brick interior for a true wood burning fireplace look. Heat output can be adjusted between four settings with the provided remote, or can be turned off to enjoy the ambiance of a fireplace without the heat. Safety features include automatic shutoff and glass that remains cool to the touch. 23" 39 3/8" 24" 24"